Wing span (spanwijdte) 2050 mm 81"
Fiberglass fuse and balsa built -up wing. Wing Covering Material: Solartex Fabric Covered, painted, decals applied and clear coated. The aircraft has a beautiful non glossy finish. Retracts: including wheels, oleo struts and electric retract system. Incorporate all of the latest design improvements. 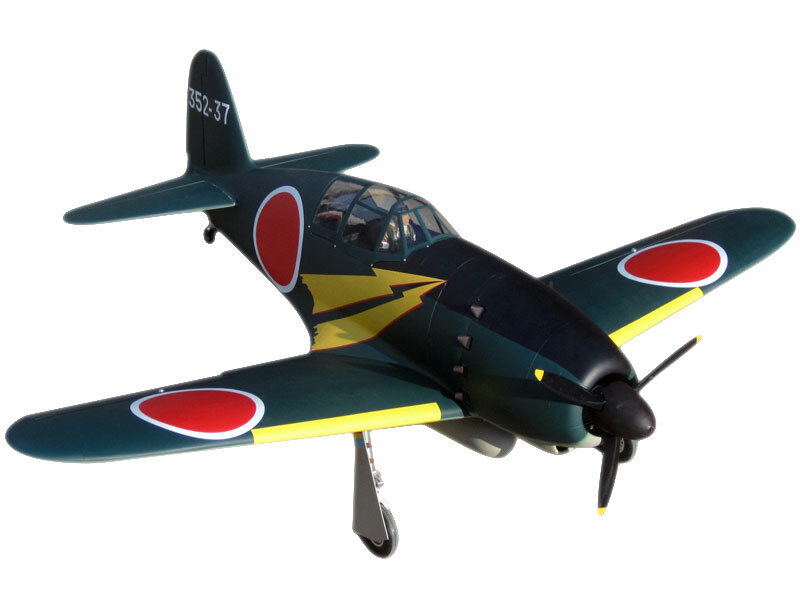 Although designed to a 1939 requirement, at a time when Japanese war leaders scarcely imagined a situation requiring a home defence fighter, the Mitsubishi J2M3 Raiden (thunderbolt) only came into its own while defending the Japanese homeland against American raids in the last year of the war. The Japanese navy's emphasis upon speed and climb rate, rather than its customary demands for range and manoeuvrability, prompted the designer Jiro Hinkoshi to adopt a squat single-engine design with long-chord radial engine cowling, laminar-flow wings and high-raked, curved windscreen. First flight of the prototype J2M1 took place on 20 March 1942, but the aircraft soon attracted criticism from navy pilots on numerous s, not least that the view from the cockpit was inadequate. Modifications to rectify these shortcomings were delayed owing to Mitsubishi's preoccupation with the A6M. Production J2M2 fighters left the factory slowly and entered service with the 381st Kokutai late in 1943, and were followed by the J2M3 with a stronger wing stressed to mount four 20-mm cannon. The heavier armament now restricted the performance of the Raiden to the extent that it no longer met the original demands, and the J2M4 was an attempt to restore the performance by including a turbocharger. The final production variant, the J2M5 (34 built), was powered by a 1357-kW (1,820-hp) Mitsubishi Kasei 26a radial. In all, 476 J2Ms were built. In acknowledgement of the fact that J2Ms couldnot combat the Boeing B-29s at their operating altitudes, some J2M3s were armed with two upward-firing 20-mmcannon in addition to their wing guns. (The Allies ed the reporting name 'Jack' for the J2M).